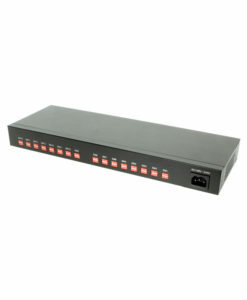 The USB-16COM-RM is a 16 Port RS-232 industrial style USB to Serial adapter, which allows the use of sixteen new RS-232 serial ports by connecting to a host USB port. Installs as a Standard Windows COM port without the need for configuration though Plug and Play. 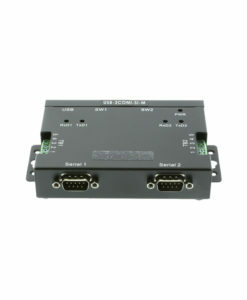 Built for rugged RS-232 serial applications with included DIN-Rail Mounting Kit. COM port number assignment can be changed as required. The USB-16COM-RM USB to 16 Port RS-232 Serial Adapter is designed for industrial applications and environments for an easier user experience of expanding serial ports. When using a host USB port on your computer or USB hub, the USB 16 Port RS-232 Serial Adapter instantly adds sixteen (16) new RS-232 serial communication ports to your system. By using Plug-and-Play features the USB Serial Adapter is installed without the need for configuration and can make use of hot plug abilities. 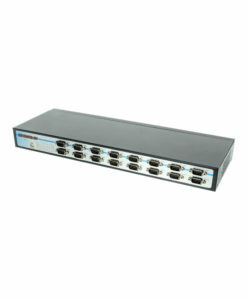 The adapter 16 Port RS-232 Rack Mountable serial adapter is automatically detected and installed. There are no IRQ & COM port conflicts, since the ports do not require any additional IRQ, DMA, memory as resources on the system. The adapter is self-powered, and has built-in switching power supply of 100V/240V (input) inside the chassis. The adapter is with DIN rail bracket for industrial application environments. The adapter can also be mounted to a 19 inches rack, the rack mount kits are included with the adapter package. The USB 16COM Serial Adapter provides instant connectivity with modems, ISDN TAs, PDAs, handheld & pocket PCs, digital cameras, POS, serial printers. It is suitable for remote access, retail and industrial applications, data collection and other applications requiring high speed RS-232 serial communication ports. 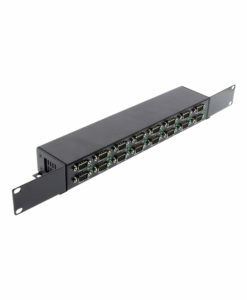 Product Dimensions: 16.889in(L) x 5.787in(W) x 1.733in(H) with DB9 connector and ears. The 16 Port RS-232 Rack Mountable USB to Serial Adapter has certain accessories that work with it. These accessories are what you can order if needed. Did you misplace or break a part that came with your 16 port serial adapter? Purchase it here!